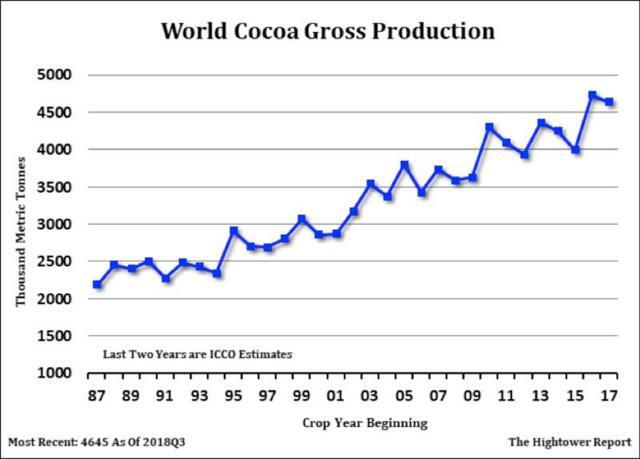 The fake scare of the season — “climate change is impacting chocolate production”. Chocolate is produced from the beans that grow on cocoa trees. These plants can only grow in a fairly narrow range of conditions, which makes them vulnerable to changes in the environment. Unfortunately, climate change is threatening some of these key growing regions. According to the IPCC, rising temperatures and a relative reduction in rainfall could make areas like West Africa less suitable for cocoa production in the future. Changes to the climate are also pushing cocoa-growing regions to higher altitudes in some parts of the world, which can make some crops unsustainable. We can see just how hard cocoa crops have been hit by record heat and 500 billion tons of carbon. Since 1989 humans have put out more than 50% of all anthropogenic CO2 emissions since homo sapiens went sapien. There is an undeniable trend here. Climate alarmists like to go on about how climate change will be deadly as more “extreme weather” events kill people. As usual the truth is different as Bjorn Lomborg point out. Bjørn Lomborg writes on Facebook about some new and surprising data that turn climate alarmist claims upside down. Fewer and fewer people die from climate-related natural disasters. This is clearly opposite of what you normally hear, but that is because we’re often just being told of one disaster after another – telling us how *many* events are happening. The number of reported events is increasing, but that is mainly due to better reporting, lower thresholds and better accessibility (the CNN effect). For instance, for Denmark, the database only shows events starting from 1976. Instead, look at the number of dead per year, which is much harder to fudge. Given that these numbers fluctuate enormously from year to year (especially in the past, with huge droughts and floods in China), they are here presented as averages of each decade (1920-29, 1930-39 etc, with last decade as 2010-18). The data is from the most respected global database, the International Disaster Database. There is some uncertainty about complete reporting from early decades, which is why this graph starts in 1920, and if anything this uncertainty means the graph *underestimates* the reduction in deaths. Notice, this does *not* mean that there is no global warming or that possibly a climate signal could eventually lead to further deaths. Instead, it shows that our increased wealth and adaptive capacity has vastly outdone any negative impact from climate when it comes to human climate vulnerability. Notice that the reduction in absolute deaths has happened while the global population has increased four-fold. The individual risk of dying from climate-related disasters has declined by 98.9%. Last year, fewer people died in climate disasters than at any point in the last three decades (1986 was a similarly fortunate year). Somewhat surprisingly, while climate-related deaths have been declining strongly for 70 years, non-climate deaths have not seen a similar decline, and should probably get more of our attention. If we look at the death risk for an individual, seen below, the risk reduction is even bigger – dropped almost 99% since the 1920s. The cost of electricity on Thursday in two states of Australia reached a tally of $932 million dollars for a single day of electricity. Thanks to David Bidstrup on Catallaxy for calculating it. In Victoria, per capita, that means it cost $110 for one day’s electricity. For South Australians, Thursday’s electricity bill was $140 per person. (So each household of four just effectively lost $565.) In both these states those charges will presumably be paid in future price rises, shared unevenly between subsidized solar users and suffering non-solar hostages. The costs will be buried such that duped householders will not be aware of what happened. Coles and Woolworths will have to add a few cents to everything to cover their bills, and the government will have to cut services or increase taxes. No one will know how many jobs are not offered or opportunities lost. This is the road to Venezuela. If Hazelwood had still been open, the whole bidstack would have changed, quite probably saving electricity consumers in those two states hundreds of dollars. Eight million Australians could have had a weekend away, gone to a ball, or bought brand new fishing gear. And this is just one single day of electricity. If Liddell closes, things will get worse, no matter how much unreliable not-there-when-you-need-it capacity we add to the system. Indeed, the more fairy capacity we add, the worse it gets. NSW will soon join the SA-Vic club. This is what happens when an electricity grid is run by kindergarten arts graduates who struggle with numbers bigger than two. The socialist Labor-Greens are already trying to blame it on coal, but we ran coal plants for decades without these disasters. Right now, no one is investing in coal because of bipartisan stupidity. What company would pay the maintenance fees on infrastructure so hated by the political class? The coal plants are being run into the ground. Maintenance is even being delayed to keep the plants running through peaks like this. No country on Earth with lots of renewables has cheap electricity. How many times do I have to repeat it? This is my mantra for 2019. In Australia when we had mainly coal and no renewables our electricity was cheap and reliable. Now we are still mainly coal, but all it takes is a poisonous small infiltration of subsidized unreliable renewables to destroy the former economic incentives, the whole market, the system: our lifestyle. This is surely a crisis. As long as the Liberals are a Tweedledum version of the Labor party, they can’t solve this and deserve to lose. New renewables installations must be stopped immediately — put on hold indefinitely — until they no longer need forced subsidies, until the RET is gone, the carbon taxes, the hidden emissions trading scheme and we have a proper free market. Then new renewables can be permitted to compete with all generation alternatives, though all new generators will also have to be responsible for paying for extra transmission lines, back up batteries, and any other frequency stabilization required. On net a generator must be able to guarantee that when the people call on it, it can provide, lets say, 80% of total nameplate capacity. When that day comes (thirty, fifty, years from now or maybe never) I will be happy to support renewables. Until then, we are global patsies handing over glorious profits to energy giants, renewables companies, Chinese manufacturers, and large financial institutions. Lets have a plebescite: How many Australians would rather have a weekend away with their family or make the world 0.00 degrees cooler in 100 years in a symbolic display to assuage the Gods of Storms? So why are we still in the self-destructive “renewables” obsession which is driving up power prices for no benefit at all to anyone except the subsidy seekers? Here is a graph that tells you why our electricity prices have gone from being the cheapest in the developed world to amongst the most expensive. Yes it is the “unreliables”- solar and wind. The 1970’s through to 2005 suddenly look like a golden age. This unreliability of the science is now a widely accepted scandal in many other areas of study and it has a name: the replication crisis. When checks are made to replicate or confirm scientific results, it is regularly found that about half have flaws. Scientists from James Cook University have just published a paper on the bleaching and death of corals on the Great Barrier Reef and were surprised that the death rate was less than they expected, because of the adaptability of corals to changing temperatures. It appears as though they exaggerated their original claims and are quietly backtracking. To misquote Oscar Wilde, to exaggerate once is a misfortune, to do it twice looks careless, but to do it repeatedly looks like unforgivable systemic unreliability by some of our major science organisations. The very rapid adaptation of corals to high temperatures is a well-known phenomenon; besides, if you heat corals in a given year, they tend to be less susceptible in the future to overheating. This is why corals are one of the least likely species to be affected by climate change, irrespective of whether you believe the climate is changing by natural fluctuations or because of human influence. Corals have a unique way of dealing with changing temperature, by changing the microscopic plants that live inside them. These microscopic plants, called zooxanthellae, give the coral energy from the sun through photosynthesis in exchange for a comfortable home inside the coral. When the water gets hot, these little plants effectively become poisonous to the coral and the coral throws them out, which turns the coral white — that is, it bleaches. But most of the time, the coral will recover from the bleaching. And here’s the trick: the corals take in new zooxanthellae, that floats around in the water quite naturally, and can selectselecting different species that are better suited to hot weather. Most other organisms have to change their genetic make-up to deal with temperature changes — something that can take many generations. But corals can do it in a few weeks by just changing the plants that live in them. They have learned a thing or two in a couple of hundred million years of evolution. The problem here is that the world has been completely misled about the effects of bleaching by scientists who rarely mention the spectacular regrowth that occurs. For example, the 2016 bleaching event supposedly killed 93 per cent, or half, or 30 per cent of the reef, depending on which headline and scientist you want to believe. However, the scientists looked only at coral in very shallow water — less than 2m below the surface — which is only a small fraction of all the coral, but by far the most susceptible to getting hot in the tropical sun. A recent study found that deep-water coral (down to more than 40m) underwent far less bleaching, as one would expect. I estimate that less than 8 per cent of the Barrier Reef coral died. That might still sound like a lot, but considering that there was a 250 per cent increase in coral between 2011 and 2016 for the entire southern zone, an 8 per cent decrease is nothing to worry about. Coral recovers fast. But this is just the tip of the exaggeration iceberg. Some very eminent scientists claim that bleaching never happened before the 1980s and is entirely a man-made phenomenon. This was always a ridiculous proposition. A recent study of 400-year-old corals has found that bleaching has always occurred and is no more common now than in the past. Scientists have also claimed that there has been a 15 per cent reduction in the growth rate of corals. However, some colleagues and I demonstrated that there were ­serious errors in their work and that, if anything, there has been a slight increase in the coral growth rate over the past 100 years. This is what one would expect in a gently warming climate. Corals grow up to twice as fast in the hotter water of Papua New Guinea and the northern Barrier Reef than in the southern reef. I could quote many more examples. Read the full GWPF story here. Peter Ridd was, until fired this year, a physicist at James Cook University’s marine geophysical laboratory.